HomeAim High Profits News Will The Bulls Run With Bullzi Holdings Inc. (BLLZ)? Whether its through scans, chat rooms, chart reading or catching newly issued press releases, the hunt for hot penny stocks never ends. Looking to find the ticker no one knows about and get their first has long been a proven method of how to grab the cheapest shares and plan for the highest returns. 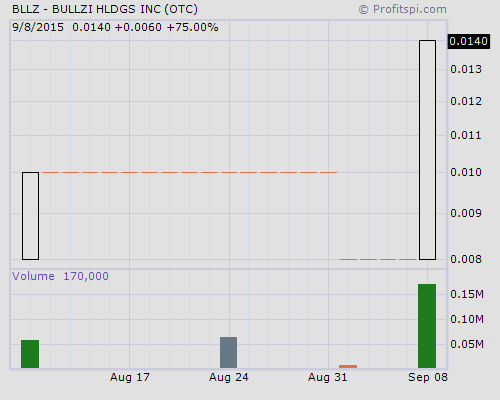 Traders may want to strap up and prepare for a running with the bulls after Bullzi Holdings Inc. (OTC PINK: BLLZ) made it clear, just before the end of trading yesterday, as to why BLLZ stock may just blossom into a rose of a trade, especially since no significant amount of cheaper shares has yet to be hacked into. Just minutes before the closing bell on Tuesday, Bullzi Holdings dropped news that they had finalized the acquisition of SecuSolutions Ltd., a Canadian information security products provider and named Jim Kootnekoff as the new President and CEO, effective immediately. Part of the deal was to “rollback” a prior acquisition of Postursizer Inc., move which meant return the assets to the former owners in return for 350,000,000 BLLZ shares which were subsequently returned to Treasury, reducing the issued and outstanding shares by 82%, down to 74,000,000 from 412,000,000. Three weeks ago, on August 14, Bullzi Holdings said that they signed a Memorandum of Understanding to acquire the Canadian information security products provider, SecuSolutions Ltd. The news fell on deaf ears as not a single shares of BLLZ stock traded – a trend which has been much of the trading hostory for the four years late filing, “STOP” sign issued ticker. SecuScan is a highly intuitive automated vulnerability detection service that was developed to provide the end user with a comprehensive daily report on the security status of their mission critical networks, and web applications. The Company’s team of Security professionals have an average of 20 plus years each, of experience working with corporations across the globe which, through their reseller partnerships, have served the likes of Nintendo Japan, Mizuno Sports Japan, Allianz Life Insurance Japan, LG America, KDDI America, Telehouse America, Double Click Japan, Shimano and Transcosmos. In April, SecuSolutions teamed up with Black Eagle Security Team Inc. to create a strategic alliance that will help all types of corporations and government agencies defend against the increasing threat of cyber security attacks and malicious intent. How valuable this acquisition of SeurSolutions is will continue to be an unknown until filings hit, but what has been made public is that just 74 million shares are issued. Someone grabbed $1,870 worth, 170,000 shares, of BLLZ stock in the last few minutes of trading on Tuesday, taking the ticker out of subpenny land and putting a copper price tag on it. How well the bullish news announcement about the deal and share structure is received will reveal itself once the Level 2 screens get refreshed today. In comparison, Electronic Control Security Inc. (EKCS), a leading provider of integrated entry control and perimeter security system technologies to the government and private sectors, offers a much more attractive structure with a smaller float. Last updated by Timothy Richards at September 9, 2015 .